When you finally realize that you are in need of a professional Chicago Bathroom remodeling service, you need to feel confident that you choose a contractor that can deliver 100% customer satisfaction. This is why so many people choose Peralta Painters for this and plenty of other projects around the home. Most homeowners make the mistake of viewing the bathroom as just a room of necessity. They treat it as merely functional and neglect putting much thought into designing it, or end up putting off remodeling it for years. We have the ability to help show you the full potential that your bathroom has. This room can be a place where you can enjoy getting ready for work in the morning or be able to relax in at the end of that same long work day. We can help you create more of an oasis spa type atmosphere than just a room no one wants to think about, talk about or use. It starts with getting a better idea of what components go into renovating the bathroom. How exactly can you finally have a bathroom that you love? It can actually be quite easy, it is simply about knowing the options that you have and making choices that will work for you and your family dynamics, as well as lifestyle. Whether you want to live in the lap of luxury or would like to keep things simple, clean and modern, that is up to you. We are simply there to explain your choices and help you make good choices. Cabinets – Although smaller bathrooms may not have any cabinets, then you have to make plans for some type of storage. Vanity – This is what holds the sink and can be as large or petite as you want, or as space allows. Lighting – It is a good idea to have strong lighting for things like applying makeup but also soft lighting to enjoy a soak in the tub. Tub and/or Shower – This may also be determined by space, but having a shower and a tub is a great way to be able to enjoy this room. The time to get started with your Chicago Bathroom remodeling project is now! And the name to call on to get it done is the Chicago Painting Contractor. We take great pride in all of the work that we do, including helping transform merely functional bathrooms into stunning spa-like ones. Give us a call today and let us provide you with the individual care and attention that you need to get the job done to your satisfaction. 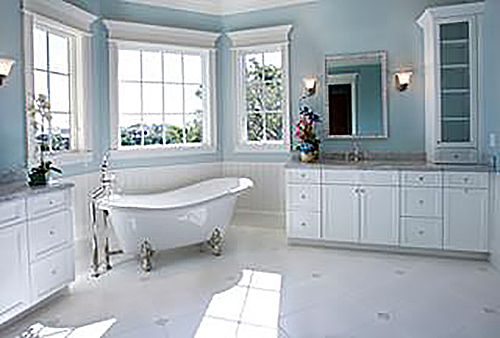 If you are looking for a Chicago Bathroom contractor then please call 773-803-6100 or complete our online request form.